© The Nalzler Trust. Photograph by R. H. Hensleigh and Tim Thayer. The work of Gertrud and Otto Natzler has become synonymous with complete harmony between form and glaze. After meeting in Vienna, the couple became interested in ceramics and studied together at the workshop of Franz Iskra. They established their own workshop in Vienna in 1935 and were awarded a Silver Medal at the World Exposition in Paris in 1937. Gertrud and Otto married in 1938 and moved to California, where they taught and collaborated until Gertrud’s death in 1971. With Gertrud throwing the pots and Otto formulating the glazes, their ceramic work found a complete unity of expression. This vase, with its molybdenum crystalline glaze, is a fine example of Otto’s experiments with reduction firing (the extraction of oxygen from the oxides in the glaze) and the special effects he achieved with melt fissures. 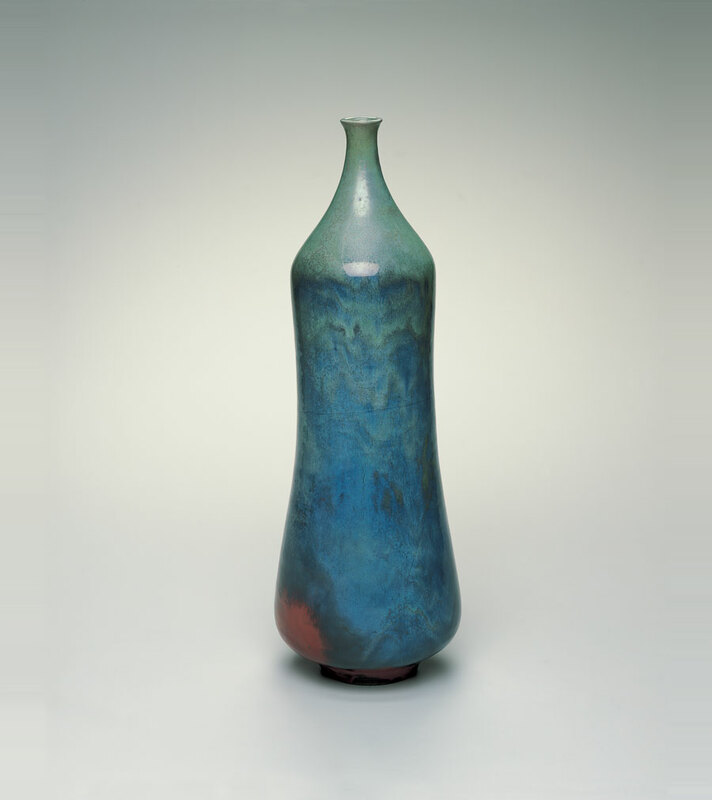 The beautifully proportioned shape of the vase is typical of the closed forms Gertrud preferred in her later years.